Railway Vehicle Engineering Limited (RVEL) is a national rolling stock maintenance and engineering company based at RTC Business Park. RVEL maintains Network Rail’s Infrastucture Monitoring Fleet, which performs a vital role in keeping Britain’s railways moving. It has many other important rail related contracts for passenger and freight train operators. Loram UK Ltd specialises in engineering work on railway traction and rolling stock. 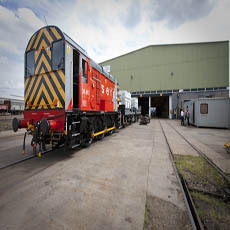 We are based in Derby, at the heart of the UK rail industry, and offer modern, well equipped workshops that allow us to offer customers a full range of rolling stock engineering solutions; from train servicing through routine fleet maintenance to the heaviest of vehicle and component re-engineering projects. The reliability of a customer’s fleet determines the effectiveness of their operation and their reputation in the market. Our reputation is dependent on how well we support our customers and their fleets. We take pride in our positive working relationship with fleet owners and their engineering teams, so whilst many of our competitors will talk of project to specification, on time and on budget, we actually deliver!